what is it with these anglophone schools? Yes (851), No (2537), Abstain (148). Yes (1022), No (2065), Abstain (123). Yes (1285), No (2049), Abstain (163). Global national has a video showing the police breaking down their own barricades to attack the students (March7 newscast)...pretty disgusting...as the students were being contained on the other side ...shows how the police have just deteriated to a lawless gang. Unfortunately the reactionary wing tends to be better organized than the progressives at some schools. I don't have an inside report yet on what went wrong at Dawson. But if you watched the Concordia live feed yesterday, you could see a few eloquent speakers from the floor making legitimate-sounding statements, like the one on the picket-line amendment: "It is illegal to prevent people from going about their business, going to class, etc." The stupid amendment (which should have been ruled out of order, since it was not consistent with the spirit of the main strike motion) ended up passing narrowly. At a general assembly, unless the sabotage is opposed with facts and passion, it can succeed. Organization is everything. Meanwhile, there's a demonstration about to start at Sherbrooke city hall, and more demos planned for Montréal this afternoon and evening. ..unionist, my french is not very good so i am limited to what i can dig up in quebec. i was wondering where is labour in regards to the students and the austerity measures in general. here in bc there is poltential for major confrontation as a number of major contracts have/are expiring at the end of march. i believe the teachers stirke will lay bare labour's intent in bc. this is not to say that they cannot be pulled into action by events occurring in another part of the country. i get a sense of intensity coming from the bc fed. there must be pressures building and they have to come up with a plan. they can see greece very well. otherwise i see buisness as usual from them for now. like the students, teachers have public support. that's a good sign. ..unionist, my french is not very good so i am limited to what i can dig up in quebec. i was wondering where is labour in regards to the students and the austerity measures in general. 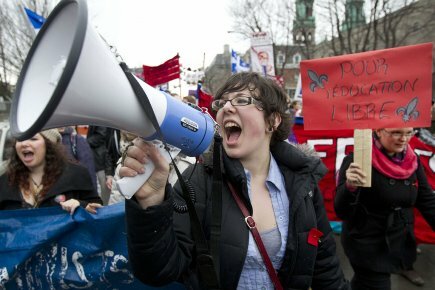 Well, labour is with the students and against the last Charest budget. Everyone was there more or less in force for the big demos last year. What I don't see is concrete joint action right now. But that's hard to do, unless you're planning something big and have really mobilized the troops. Hasn't been done. The CSN is asking the Minister of Education, Line Beauchamp, and her government to renounce the increases to tuition fees and agree to undertake a debate on the financing of education. Let me know if you want more info or translations. [url=http://www.montrealgazette.com/news/Students+take+streets+again/6272547/... marched again today[/url] in Montréal to mark both the student strike and International Women's Day. Camille St-Aubin took part in the march for two reasons — for International Women’s Day and the students’ protest. A student at the Université de Montréal, St-Aubin called the plan to raise tuition fees an “atrocious idea” and argued that women will be especially affected because single mothers who will want to go back to school won’t be able to do so. Thursday’s demonstration had a feminist theme, in keeping with International Women’s Day, with bras and symbols of womanhood adorning signs. The students’ peaceful protest ended at the corner of Guy St. and De Maisonneuve Blvd where a smaller group began a march in the rain to mark International Women’s Day. ..txs unionist. in fact there is. there's this. i'll appreciate anything you have time for. I had a look at it. It's basically a 7-minute ad for this [url=http://pljunet.info/proposition]proposal[/url], which the author wants students to submit as a motion at their general assemblies. The motion, if passed, would essentially create an association, or coalition, of student groups who agree to reject, in advance, any deal that would fall short of complete elimination of the government's 5-year phased tuition increases. It would require breaking relations with any association that agrees, or has agreed, to put such proposed deals before their membership. It accepts the possibility of jeopardizing the 2012 winter session as being the strongest weapon the students have and invites others to do the same. And it mandates a per capita of $0.25 toward the new coalition. The video itself shows how the whole strike movement, like previous ones, gets played out in a tightly scripted environment. The MSM pretend to have a dialogue. The left (and he singles out QS for some reason) and the right (both right-wing ideologues among the students, and the state) use bureaucratic methods or force to limit the movement. And the movement gets betrayed and doesn't achieve its aims. The problem, of course, is that any teacher strike would be illegal during the term of a collective agreement. Still, several dozen CÉGEP and university teachers met on Tuesday to talk about a broad range of actions, from symbolic ones to a one-day strike on March 22 (planned as a general strike and demo day for all students) - and an informal group have written to colleagues to plan more discussion. Jean Trudelle, president of the FNEEQ-CSN, supports his militant colleagues, and he himself participated in the Tuesday gathering. "We're looking at many different actions", said the union leader. "We want to show that we're not only in support of the students, but that we consider this as a social issue of absolutely primary importance." Quebec students heightened their protest activities this past week, now moving ahead with a strike (or boycott) in an effort to dissuade the provincial government from planned increases that will see tuition swell by 75 per cent over the next five years. Reaction to the tuition hikes – and to the ensuing student protests – has been predictable, in particular in the national media. The reasoning goes something like this: the hikes are simply common sense; everyone must pay their fair share; students in Quebec are whiners who should simply get over it. CLASSE has published a special edition if its newspaper aimed at Quebec high school students (equivalent to grades 7-11 in Ontario). During 2005, high school students joined the general strike and CLASSE is calling on them to do it again this time. Next weekend will see a 48-hour musical marathon, with some 175 artists performing, in support of the student strike! Sing and play for victory! Moreover, the FEUQ and the FECQ (university and CÉGEP student federations) will get involved in community activities throughout the week all over Québec. Mme Desjardins said that by so doing, students wish to "give back what Québec society has invested in them". MONTREAL – Students continued protesting rising tuition fees today with a group of about 1,000 demonstrators sitting silently in front of Premier Jean Charest's office on McGill College Ave., holding their hands up in peace signs. The demonstration lasted until about 11:30, with the last protester leaving and the street re-opening just before noon. Earlier in the day, the administration at the Université du Québec à Montréal shut several of the buildings on its downtown campus Monday morning to prevent student protesters from occupying the pavilions. Student protesters had been blocking entry to some buildings on the campus since 7 a.m. The Thérèse-Casgrain, Hubert-Aquin, Paul-Gérin-Lajoie and Judith-Jasmin buildings were declared off-limits by the adninsitartion. The university said its other facilities will remain open. ..this video was released mar 5th so the totals number is up now. very well done is why i'm posting it. McGill Arts undergrads last evening voted 55% against joining the strike. 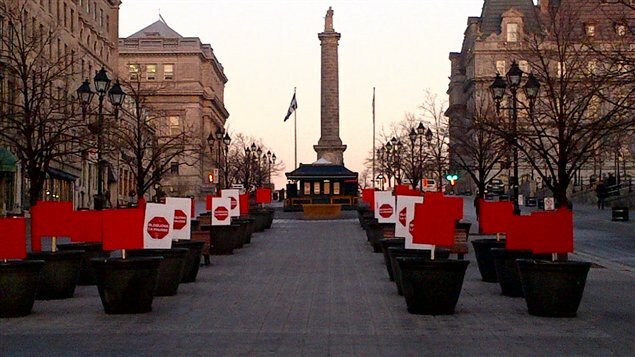 McGill Post-Grad Society previously voted to go on a 3-day strike leading up to the March 22 one-day national strike. The student strike has revealed an important generational divide within Quebec anglophone communities. While I'm admittedly not born in Quebec, I think in many ways I am representative of my generation of anglos. The only Quebec we've ever known is post-Bill 101, and we don't have the same baggage and hangups as those from past generations - the people who represent the anglo community in the media, at city halls, and at the National Assembly. We're bilingual and bicultural, we have both anglo and franco friends, and we live our lives not on one side of a solitude, but constantly in between. The student movement against rising tuition is getting bigger once again. A couple of union centrals have now thrown in their support. The CSN and the Quebec teachers' union the CSQ say they stand behind the students and their cause. Léo Bureau-Blouin is with the Federation of CEGEP students. He says this shows the whole community is rallying behind them. "Teachers will now walk side by side with the students," he says. "I think this shows that this not just a student movement anymore but a social movement." Meanwhile with the Quebec budget being tabled next week, the group has some suggestions for the government on how they can fund education without increasing tuition. One idea is to increase corporate taxes and the other is to bring back the capital gains tax. Striking students are on the move once again through downtown Montreal this afternoon, disrupting traffic along Rene Levesque around Peel, and reportedly throwing fireworks at police. Organizer refuse to give police their intended route. The rally was organized by the Coalition large de l'Association pour une solidarité syndicale étudiante (CLASSE). They're the same group that managed last week's protest outside Loto-Quebec offices, on Sherbrooke Street. 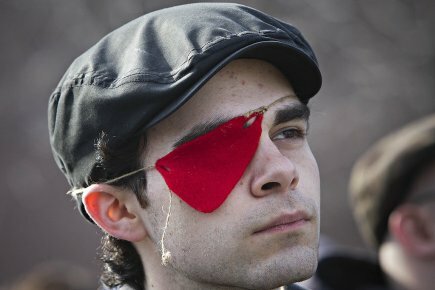 One demonstrator, Francis Grenier, was seriously injured in the eye, allegedly by debris from a stun gun. 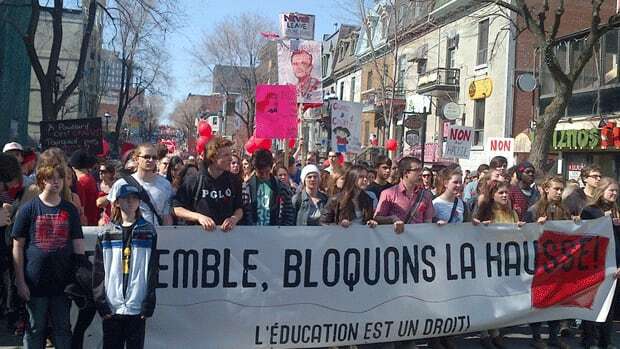 More than 140,000 students in Quebec are currently on strike , frustrated with the Charest government's decision to raise tuition by more than $ 1,600 within five years. Monday, hundreds of students had a sit-in for several hours on St. Catherine Street at the corner of Sanguinet Street. En prévision de la Nuit de la Création des grévistes, la direction de l'UQAM a bloqué l'accès à plusieurs pavillons par mesure de sécurité. Loin d'être découragé(e)s, les étudiant(e)s ont investi la rue Sainte-Catherine, et en ont profité pour revendiquer en s'amusant! I initially thought this article would be written for, and read by, a campus on strike. I didn’t believe that the AUS would vote to strike, but there was always hope. The AUS GA was six hours of exhausting political soul sucking that snatched that hope away from me. These are my thoughts on the AUS GA and where those who voted ‘yes’ to a strike can go from here. The McGill Social Work Student Association (SWSA) voted to go on unlimited general strike yesterday in opposition to upcoming tuition increases ordered by the Quebec government. 7. The strike is location par excellence for experiential learning of political processes. Collective actions and strikes in particular, are unique moments for students to develop critical consciousness, to learn to deliberate and to feel empowered. Many commentators who, since the fall of the Berlin Wall, had been lamenting youth’s apparent lack of interest in politics had a field day explaining how the Occupy Movement was all about doing politics outside of official channels. Where are these commentators now? What is going on in the student movement today is Occupy on steroids! With a clear demand! Historically, Quebec universities have been funded by the public on the grounds that society is enriched as a result. With public funding, tuition fees have remained low and higher education has remained accessible. Under Quebec's educational social contract, university graduates who achieve success in the labour market keep university costs low for the next generation through their tax dollars. This arrangement is a crucial part of maintaining a more equitable society in which people have access to health care and education no matter what their income is. This is what the student movement is fighting to defend today. Today, a "family" (all-ages) demonstration in support of the student struggle kicks off at Parc Lafontaine (corner Cherrier) at 1 pm. Hope les flics don't gas the babies and elders! Why not? If they're complicit in student terrorist activities, they shouldn't get a free pass. ... and the Québec Federation of Women, the main housing and poverty activist organization (FRAPRU), and the National Federation of Québec Teachers will hold a joint press conference to support the students' demands and challenge the provincial government two days before the budget is tabled. The red is the symbol of the strike, the patch is to condemn the stun grenade attack which injured Francis Grenier. While Charest dined last night at the upscale (and appropriately named) Au Pied de Cochon, about 30 demonstrators managed to drape a black flag over the front window, and shout slogans and make a racket with garbage cans behind - until police arrived and told them they could only afford to patronize cheap joints. No bloodying of demonstrators and no arrests - for a change. Peace in our time! The Concordia faculty members write, in their list of reasons to support the strike, "A university education has become a prerequisite for most jobs." Surely this isn't true, not yet anyway. And what does this say about their attitude towards jobs in the trades? Yeah, I think "many jobs" would have been more accurate. But did you find anything else in their statement worthy of support? Student groups are hosting family-oriented protests across Quebec Sunday against the government's planned tuition fee hikes. Protests and marches are taking place in Montreal, Sherbrooke, Quebec City and Alma. Thousands gathered in Parc Lafontaine in Montreal before marching down Saint Denis Street towards the offices of the Ministry of Education. Sunday's protests follow several hundred teachers gathering for a symbolic protest in downtown Montreal Saturday. A group of roughly 200 students demonstrated outside 1253 McGill-College on the corner of Ste. Catherine where Quebec Premier Jean Charest was scheduled to speak. The outer doors to the building were opened by students and occupied until SPVM officers arrived from within the building to push students out. The officers used pepper spray. U4 Arts student and Daily staffer Ethan Feldman was one of the students pepper sprayed. “Eventually people who were blocking the door had to leave and go somewhere else. I stood at the door and I held it open,” said Feldman. SPVM spokesperson Raphael Bergeron said in a recorded message that a “little group of students” tried to get inside the building, and that the police “intervened and dispersed” them. Feldman said there were no police at the scene at the time. He said, however, police approached the students from inside the building, having entered from somewhere else. “Police began to push the doors open, push everybody out very physically,” said Feldman, who added that he hadn’t heard any warning from police before they started advancing. “At this point a police officer, seeing that I was opening the door or something to that effect, held pepper spray extremely close to my face…and he sprayed in my left eye, all over my face on the left side,” continued Feldman. Unrelenting student protests did not persuade the provincial government to back down on planned tuition hikes, with the $325-a-year increase right there in black and white in the new budget tabled on Tuesday. And now, with the latest budget confirming what students have been battling to change, there is really no end in sight. Students say they will only ramp up pressure and plan to unveil a new action plan as early as this weekend. And they say going back to class is not an option. That's the McGill I know and love. A fearless fortress against solidarity and justice in the heart of downtown Montreal. No man, it's an island! Also: love the eye patch! I can hardly wait - 220,000 will be on strike Thursday - and the demonstration! A couple hundred Concordia students gathered on de Maisonneuve Blvd. outside the Hall Building in a flash mob that blocked traffic during rush hour on March 20. The road had been blocked since earlier in the morning as groups of students occupied the street while singing, dancing, holding workshops and discussion groups. Getting hit with pepper spray or tear gas is a miserable experience. But it won’t kill you. Suanne Stein Day is the chairperson of the [Lester B. Pearson School Board - English language board]. She tells CJAD that they heard through parents and staff with kids in their schools that protest organizers are using Facebook to reach high school kids. "There were some suggestions that buses would be sent to the schools to pick up students who want to attend. We don't have confirmation of that but we decided that a precautionary note to parents was in order." The English Montreal School Board is also taking preventive action. Michael Cohen, official at the board, says a note has been sent to the principals at all of their high schools about the situation and to be aware of any unexplained absences. "Students should be aware that Thursday is a regular day of school and that any striking will be unacceptable," Cohen says. The first video on this page shows a significant number of students in a Gatineau high school who participated in a demonstration despite the threats of disciplinary action brandished by the school. Elsewhere at the high school level, information kiosks have been banned, a student has been suspended for one day for having distributed red squares (! ), some schools have prohibited students from wearing them. Other schools/school boards seem to behave less hysterically: the representative from the Commission scolaire Marguerite-Bourgeoys, to which the Paul-Gérin-Lajoie school in Outremont (the first one to vote on a one-day strike) belongs, sounds relatively sensible in the Devoir piece linked above. At the university level: Concordia University and Université de Montréal will be closed tomorrow. There are currently 239 907 students on strike. Tomorrow, the count will reach 303 308. Those two 'redecoration" actions are amazing, Bärüler. Thanks for sharing. This is pretty sweet: more than 300 advertising posters around the city have been replaced/covered with strike posters.